Following on from my last post I thought I’d show you how the circle pendants come to be. Truly it is a collaborative process, with client input vital to the finished design. It’s not unusual for me to have a number of projects on the go at a given moment and so some pieces and people are linked in my mind though they may have never met. This is true of Sue and Gillian and their two recycled yellow gold circle pendants. 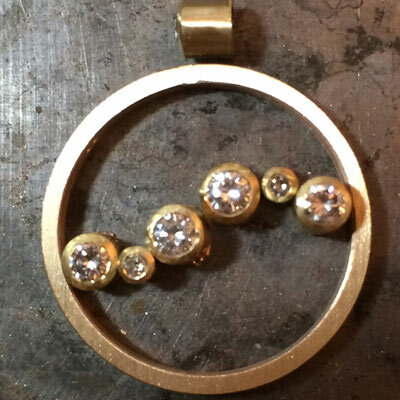 Below you can see a variety of possible configurations from which Sue chose her elegant diamond circle pendant. You may even notice that I had more diamonds than made it to the final design, but Sue was also having a bunch of stacking rings made, so I preset the lot in yellow gold tube and had a play to see what might go where. The winner was this simple five stone graduating style with a little asymmetry thrown in for good measure. Meanwhile in the blue corner Gillian had three sapphires given to her by her mum which she wanted to include within the circular form. The three stone combinations weren’t quite doing it for her so we added some empty gold tube to the mix to create a more dynamic piece. As you can see the finished arrangement plays with different size empty spaces offset by that beautiful sapphire blue. I couldn’t resist including a picture of the reverse of this pendant which I find almost as pleasing as the front. 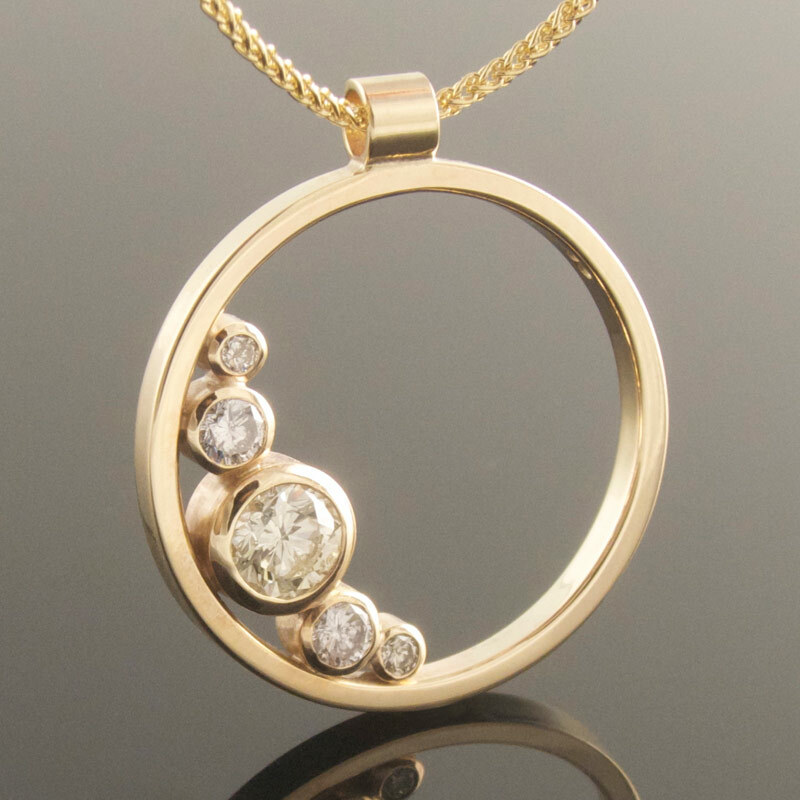 Over the last number of years my little circle pendant has proved popular time and time again. It seems I always have one of these little guys on the go. 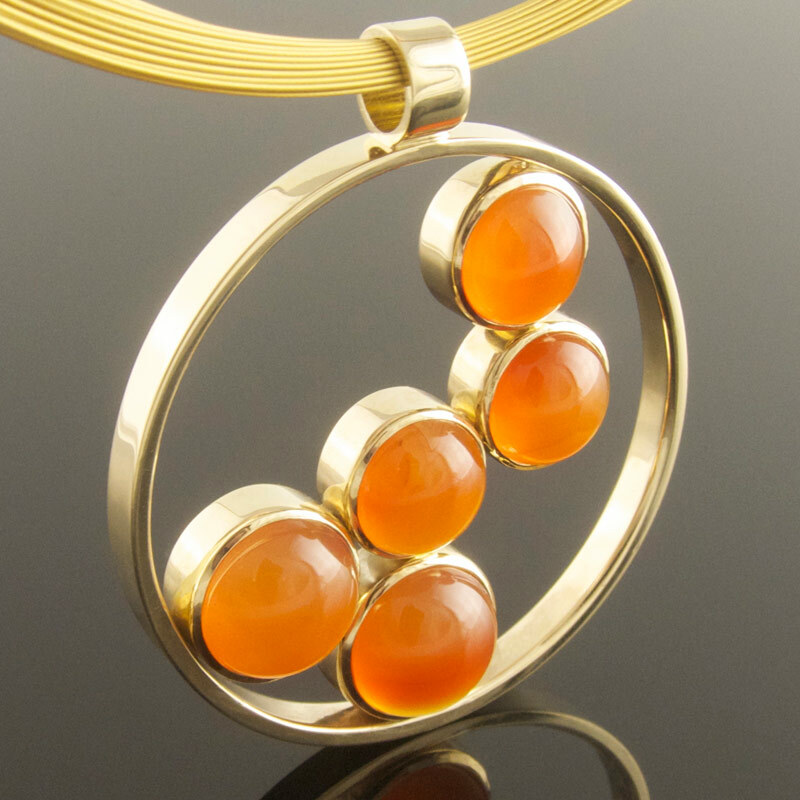 Whether made from new material or grandma’s wedding ring the simple circular form is hard to beat. It lends itself to a single stone or multiple stones depending on what you have in mind and can be as simple or as spangly as you like. It also can range in size from a €1 coin to a Digestive biscuit, well maybe a Jaffa cake - not too many rappers knocking round the Arbour. I thought it would be nice to create a gallery dedicated to this versatile little pendant so below are a number of circle pendants that I’ve made in the past and will keep adding to in future - one on the go even now. This has to have been one of my favourite projects, not least because Aileen chose to model her engagement ring on my own! She'd spotted my ring a few years back on the old website and when Derek proposed I got a little email to see whether we could meet. She tried mine and was smitten from the first, but to be 100% sure I sent them off for a little potter round town to try some other styles. It's a risky business, but you only get to choose your engagement ring once and in my opinion it's important to get it right. Happily they came back more certain than ever that this was the ring and so I sourced this lovely spready emerald cut diamond for them. This ring is remarkably simple being made from just the one bar of metal, but as is often the way, simple designs are terribly unforgiving of inaccuracy. The palladium bar was initially rolled slimmer at the ends leaving a good centimeter untouched in the middle where the diamond was to fit. With the ring turned up, the crude join was cut through and soldered before hammering the ring round. It was then run through the mill again spreading the metal and creating the required depth for the setting. Next the sides were filed flat and the tapering profile established. 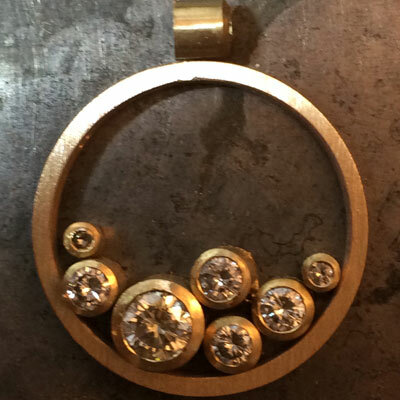 Metal was removed to create a seat for the diamond and the mount polished before finally setting the stone. And there you have it, a palladium emerald cut diamond solitaire engagement ring with room for a wedding ring to sit flush against it. Three and a half years later I still get a thrill when I look down at my finger and see my little emerald cut twinkling back up at me - I hope Aileen does too! I've been making an awful lot of recycled gold bangles of late and I thought I'd share this one which has been embellished with 5 round brilliant cut diamonds punch set at intervals across the top. Rosie had the usual assortment of broken chains, odd earrings and unworn rings which amounted to some 25g of gold and which as you can see turned in to a lovely heavy weight, flat gold bangle. From the crucible the molten metal was poured into the ingot mould to make a rather gnarly looking ingot. It was then run through the rolling mills to make it into a smooth, workable bar of metal. This bar was repeatedly passed through the mills between annealings (softening the gold by heating and quenching) until it was 200mm long, 4.3mm wide and 2.7mm deep. The wire was then turned up into an oval and the soldered closed. Once the fire stain was cleaned back, any scratches removed and the bangle prepolished I marked out 5 equidistant points along the top of the bangle opposite the seam and set each with a 0.03ct diamond. And there you have it, one gold bangle with diamonds! I've said it before and I'll say it again, I love making rings - especially engagement and wedding rings - something about the personal connection and the promise of forever gets me every time - which is why I'm always chuffed to be involved with couples at such a happy time in their lives. Joanne had been a follower of my "how it's made" posts over on facebook so when she and Dave decided to get engaged she had a fair idea of where to come. At the time I rarely made up collages of pieces that were made from scratch as opposed to recycled, but Dave put in a word and I kept this little photo diary of Joanne's engagement ring. It started with a piece of square platinum bar which was forged using the rolling mill into a graduated shank. As you can see it's a bit bockety, but that roughness was easily removed. Next I made a round bezel setting and cut a groove in the shank to accommodate the belly of the diamond, before giving everything a good pre-polish. The bezel was positioned on top of the shank and soldered in place before the diamond was set (the two little silver bars pictured were purely to support the setting while pushing the metal over the stone). Eleanor loves jewellery as much as I do and when she asked me to design a set of vintage inspired earrings I was nervous. Vintage isn't my natural style, but I figure I'm game for a challenge. The diamonds were harvested from a beautiful old brooch and had it been anyone else I would have hesitated to break up such a lovely piece, but Eleanor assured me that should she need one she had an even finer specimen! 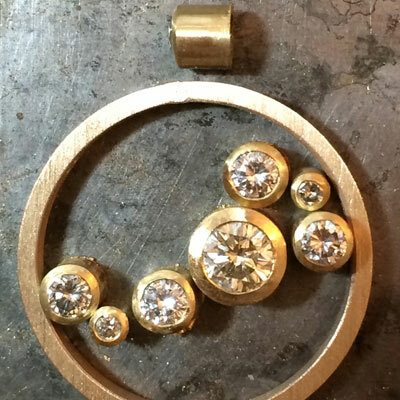 To start with I removed the diamonds from the brooch and began to play with their layout. I did some drawings and laid the diamonds on my preferred designs. Eleanor picked her favourite and I transferred this layout onto a piece the metal. In the spirit of that time the diamonds were set in silver with 18ct yellow gold hooks, jump rings and interestingly, back panels. 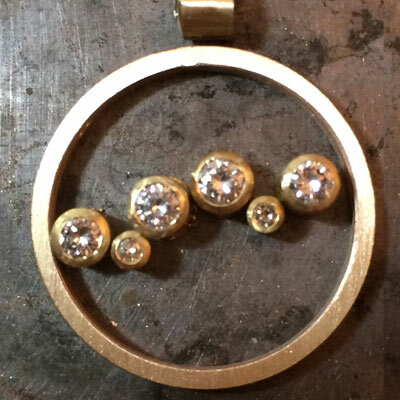 The largest diamonds were bezel set and soldered on to the silver plate before piercing out the scalloped pattern and soldering on gold jump rings. A further bezel set diamond was attached above the main panel for extra swoosh factor. 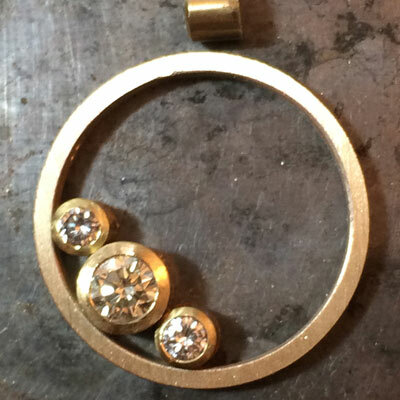 The rest of the diamonds were then set and finished with milligrain (that tiny beaded effect), before adding the gold safety backed hoops. A quick polish and they're done. Sadly the centre stone from Barbara's antique five stone diamond ring fell out never to be seen again and the ring long languished in a drawer waiting on its time to shine once more. Looking at the other pieces in her collection it seemed that diamond earrings were one of the few things missing, so we settled on making up low tapering bezels in 9ct white gold. 9ct is perfect in earrings because they don't see too much wear and tear and when rhodium plated the colour is exactly the same as 18ct, but not so the price! When popped out of the mount you can see the shape of the old cuts is totally different from the modern round brilliant cut diamond. They are usually deeper and more cushion shaped. This shape is a little trickier to set than round, but I think you'll agree the finished earrings were worth the extra trouble. Love how the cushion shape of the old cut still carries through to the bezel.